Luxurious designs and materials are not only more expensive – they are also more demanding in terms of interior decoration. So, whenever you are furnishing a house on a budget, it is advisable to stick to neutral designs and materials – simple soft wood, a little bit of glass and mirrors, fabric or velvet furniture upholstery. The approach is simple and elegant, and it will look equally impressive in bedrooms, living rooms , and kitchens. A stylish house is a consistently decorated house. You cannot just buy any furniture piece you see simply because it has a price you can afford. Think over your entire decoration picture in advance and search for items in the relevant categories. Do not be afraid, even if you choose a very specific decoration pattern – the choice of different furniture models will still be impressive. Sure, if you are not a professional carpenter, making your own wardrobe is out of the question. However, some simple items can be easily made on your own. A niche can be turned into a storage unit – just equip it with some shelves and doors. Another creative suggestion would be to arrange open shelves in unusual manner – this is another thing most people can handle independently. Coffee tables can be made out of palette racks, etc. Whenever you are furnishing a house on a budget, you should be very careful with lights and accessories. Bright curtains and an unusual chandelier can make even the simplest room look stylish and memorable. Floor lamps, wall art, personal little trinkets, carefully arranged on the shelves are some of the other objects that can make a simply decorated room look cozy and sweet. 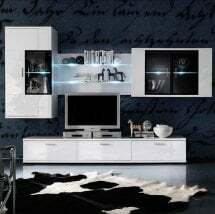 Another good suggestion while furnishing a house on a budget is not to hurry and to look for furniture at sales. The biggest ones usually happen in February and in July – just before most stores receive new furniture collections. However, there are also certain stores that offer promotions on a regular basis. Here, it is important to remember that discounted furniture can feature great quality – you just have to take some time to look. Finally, remember that big stores usually offer high quality solutions at reasonable prices. The bigger the retail chain is – the better the pricing policy will be (if compared to small and mid-size stores). In the UK, one of the best examples of a store that features exactly this kind of policy is Furniture in Fashion .